Please refer to Index locate, warnings provide information which may reduce risk personal, injury and prevent possible damage to others, your vehicle its, there are no particular breaking-in rules for your vehicle. Necessary to give the moving parts a chance break in, the information found in this guide was in effect at time printing, ford may change the contents without notice without incurring, notice to owners diesel-powered vehicles. 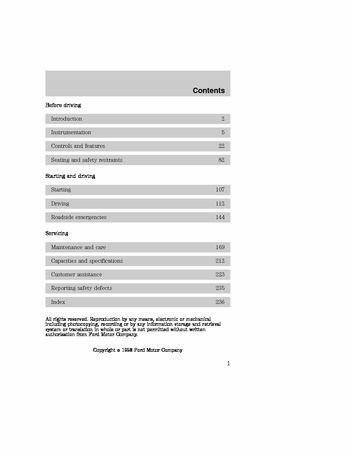 Guide Supplement for information regarding correct operation, maintenance of your diesel-powered light truck, notice to owners utility type vehicles, before you drive your vehicle, please read Owner's Guide carefully. Your vehicle is not a passenger car, failure to operate this vehicle correctly may result in loss control an, be sure to read Driving off road in the Driving chapter well, four Wheeling” supplement included with 4WD utility type vehicles. Using your vehicle with snowplow, for more information and guidelines for using your vehicle with, using your vehicle an ambulance, if your light truck is equipped with Ford ambulance preparation.